The drawing with the Crucifixion of Christ, a highlight of the exhibition The road to van Eyck in the Boijmans van Beunigen Museum in Rotterdam, is being represented as a newly discovered drawing of Jan van Eyck and/or his studio. 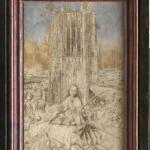 Yet, evidence does exist that this drawing originates after the death of Jan van Eyck. For some time now experts have been apprised of the existence of this drawing. The work was brought to Bruges in 2002 by its owner on the occasion of the exhibition of De eeuw van van Eyck in the Groeninge Museum in Bruges. Consequently, the drawing underwent an expert research investigation. Because of the problematic conservational conditions, the drawing is covered in a yellowed oil varnish, resulting in the damaging of the paper and drawing, and through an investigation of the naked eye and microscope, it was concluded that it was a pen and ink drawing of the latter 16th Century. The results of the current scientific investigation with regards to the expo in Rotterdam show that under the contours and shading of the pen, small lines are present that have been made with a metallic stylus. The research of Arie Wallert (Rijksmuseum, Amsterdam) also shows that the drawing was repeatedly used as a means to fill in the composition. On the grounds of these findings, a late dating is no longer compelling, nor even probable, but this does not mean that it deals with an earlier drawing, or even that it is an original. For a precise categorising of the drawing, the necessary key points are lacking. 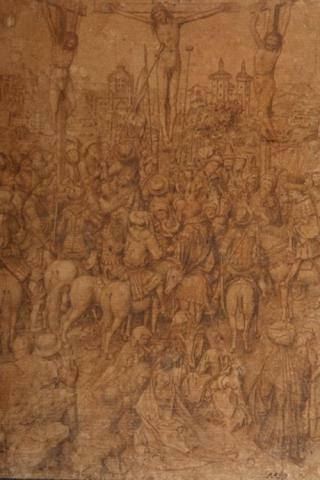 Moreover, not one of the surviving drawings from the 16th Century is likewise so elaborately executed. From the Rotterdam front, comparisons have been made with Jan van Eyck's Portrait of an Old Man (Niccolò Albergati?) from the Kupferstich-Kabinett in Dresden. Arguments for the attribution cannot support this comparison, for on the one hand it is a portrait, and on the other hand, it is a staple scene from the Passion. These are fundamental differences. That evidence has been found of traces of silver and golden styluses, it is in order with the practice of the time, but it is no argument that it is a key for the attribution to be made. The drawing of the Crucifixion of Christ can, said with strong reservation, be compared with the unfinished panel of Saint Barbara (Royal Museum of Fine Arts in Antwerp), dated 1437. For reasons unknown, this comparison was not made by the researchers in Rotterdam. If the plaits of Saint Barbara are compared with the mourning Mary in the drawing, then the differences, rather than the similarities are noticed. Comparisons between the two works deal rather with the shadings in the lower rocky foreground. In this thought experiment, it must be kept in mind in any case that the fact that the Antwerp panel deals with an unfinished study, executed with a fine pencil. What is at hand for us with the drawing of the Crucifixion of Christ, because of the precision and the superbly executed, coordinated details is a copy from an older exemplar (a painting) that is estimated to be slightly before the end of the 15th Century. Despite the problematic physical condition of the drawing, it can clearly be suggested that with regards to motifs, the diptych (attributed to Jan van Eyck and his studio, Metropolitan Museum of Art, New York) from the Metropolitan adheres quite closely with the Crucifixion. Both works have a number of figures in common, though the groups of figures also differ from each other. With regards to proportions, the differences can be explained in part by the difference in format used in both works. The latter must serve as an explanation for the fact that the drawing yields a more thoroughly worked-out crucifixion in comparison to the panel in the Metropolitan. If one does not view the drawing as a pastiche, as the Crucifixion in the Metropolitan is seen as an exemplar, and whereby the Eyck-esque producer are attributed (on this note, contemporary examples are lacking as touchstones), than the drawing exhibits a lost crucifixion from the Van Eyck studio. The drawing remains in that case to be a composite variant of the Crucifixion in the Metropolitan. The composition was taken over in the 15th and 16th Centuries in illuminated manuscripts. (Guido Messling indicates this takeover in this regard of motifs by Lieven van Lathem and in the famous Grimani Breviary in Venice). The manner in which the motifs are exchangeable is worthy of notice. This can be an indication for a series of design and exemplar sketches. The existence of such design and exemplar sketches is also, inter alia, taken up with other paintings of Van Eyck. It is interesting to posit the question of the timing of the drawing and the original composition against the Crucifixion of the Metropolitan of 1435. As such, it appears that the Crucifixion, which is survived by the drawing, is an earlier composition than the example in the Metropolitan, because it is logical that the composition was adapted to the rather unusual, broad format of the example in the Metropolitan. The lost Crucifixion was presumably also an example for motifs of works from the studio of Van Eyck, or of followers who made miniatures for the Turin-Milan Manuscript. Primarily, it has to deal with the comparisons between the compositional structure and the construction of the background. Herewith, the lost Crucifixion can probably be estimated to be dated in the beginning or middle of the 1430's.